A church located in the community of North Hykeham. *Please note that the majority of our child related groups are term time only. There may also be occasions when the Coffee Morning is not running on a particular month. If you want to find out whether the particular group you are interested is running this week, please don’t hesitate to get in touch. 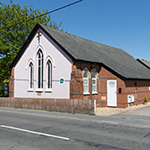 To find out more about North Hykeham Methodist Church, or to enquire about hiring the church building, please head over to our contact us page or email northhykeham@lincolnmethodist.co.uk to contact the minister.